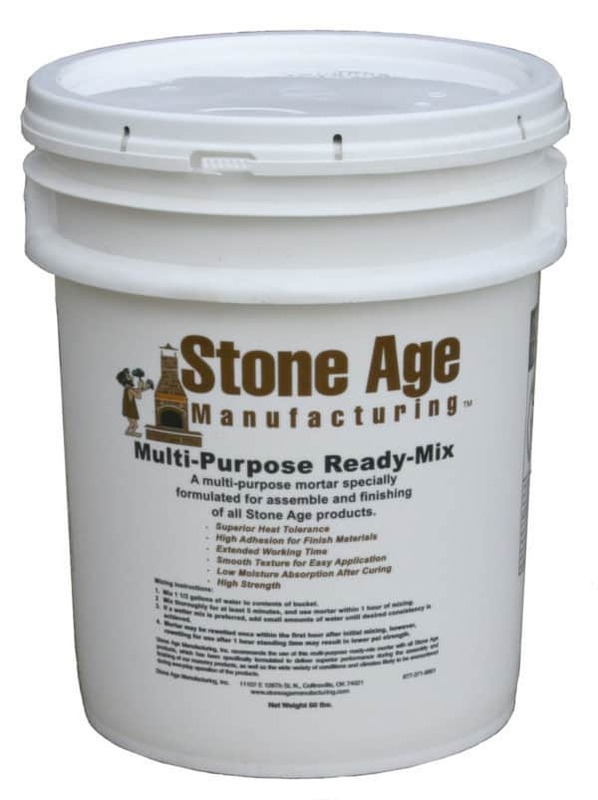 Stone Age Multi-Purpose Ready-Mix is a comprehensive blend of refractory mortar and other additives, specifically formulated for the construction and finishing of all Stone Age products. A complete, start-to-finish mortar blend in a single package, simply mix with water and you are ready to assemble and finish any project, large or small. Stone Age recommends using this product for building and finishing all Stone Age kits. Designed to withstand the high temperature conditions encountered by wood burning hearth products, our Multi-Purpose Ready-Mix provides superior performance in fire- place, fire pit or oven joints, as well as firebrick installation, and allows plenty of working time without the risk of flash setting. The Stone Age Ready-Mix also incorporates a bonding agent to facilitate the adhesion of finishing materials on any Stone Age hearth product or kitchen island kit, and is also formulated for low moisture absorption after curing.